The powerful lords of the city contend for control of Waterdeep, the City of Splendours. Behind the gleaming facade of tall buildings and winding streets, dark intrigues and shady back-alley dealing play out, leaving the city's treasures and resources ripe for plunder. 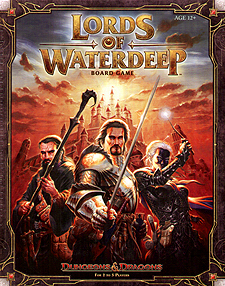 In this fast-paced game of constantly changing fortunes, you take on the role of a Lord of Waterdeep. Through your Agents, you recruit Adventurers and send them on Quests designed to win favour and spread your influence throughout the city. Expand your treasury, purchase Buildings, assign Agents - choose your actions wisely and you can become the supreme Lord of Waterdeep! Very solid gateway game that introduces players to worker placement. I played this only recently at a boardgame cafe and found it to be easy to pick up and learn from scratch. Components and artwork are very good, with little iconography to get in the way of what is a fairly straightforward game. Players are scoring victory points by completing quests in the main, although some points are available from other sources. Players will complete the quests by placing their workers (or 'agents' in this Dungeons and Dragons setting) around the city of waterdeep, and gathering resources from those spots (again in this setting the resources are people, such as wizards, warriors, clerics etc). Once a player has the right amount/type of resources they can complete that particular quest card and earn the points, as well as other bonuses. As you can probably tell, the theme is fairly 'thin' here, and ultimately this is a typical worker placement 'euro' game, but none of that matters, as the game has enough going on in it to make this an extremely enjoyable game. Players can develop buildings onto the board, which offer more worker locations that offer bonuses, and this in itself adds variability and additional intrigue into the game. Players that opt to use these spaces will trigger a small bonus for the owner of the property, so players will focus on using the basic locations on the board first and then use the extra buildings if absolutely necessary! Extra spice is brought into the game by each player having a Lord which gives them a unique set of additional VP scoring bonuses, known only to them. Additional spice is added with the 'Intrigue' cards, which players can pick up by using a worker, and these cards will offer bonuses to them, other players, or ways in which to attack or slow don other players by giving them mandatory quests to perform. I like the timer on the game, which is 8 round markers covered by VP chips, and these are uncovered and distributed onto the un-built buildings on the board, to incentivise players to build them. On round 5, each player gains an additional worker, and there are also 2 neutral workers that can be temporarily picked up during the game. I think this is an excellent game to introduce newer players to euro mechanics whilst wrapping it in a fun theme that is neither too strong or so thin it feels boring. I look forward to picking up the expansion for the game which looks like it adds another player, more of the same content and also new mechanics and locations! An excellent worker placement game with a dungeons and dragon theme. A great game for all ages. Even if you're not a D&D fan like myself don't let the D&D theme put you off, possibly the best worker placement out there. This has to be one of my favourite games that I currently own. I don't know what makes this so special because it really does have a pasted on theme - I mean you could literally remove the theme and replace it with any other theme you can think of and it wouldn't matter. The idea is that you have agents and you each have a lord card - the Lord card basically tells you what your objective is for example your lord may want you to complete Warfare and Piety quests and for everyone completed at the end of the game you will gain a bonus of 4 points per one completed. Another Lord could give you 6 bonus points for each building you own at the end of the game and so on.... Each round you use your agents to take spots on the board to pick up people required to complete your quests so you can get fighters, mages, priests and rogues. You can also take the first player token, choose the slot to pick up more quests or help yourself to money. Another feature of this game is the intrigue cards, everyone starts the game with 2 intrigue cards - these give you the option to either mess up your opponent or help you to gain resources. So, if you wanted to play one of these you go to waterdeep habour and play an intrigue card one might allow you to take 2 priests from the stock and give your opponent one priest or it may say take five gold from the reserves and place 2 gold on two spaces on the board. Then there are the intrigue cards which mess around with your opponents gameplay - these are Mandatory quests and these again are played at waterdeep habour. When a person is given a mandatory quest that player has to complete that quest before completing anything else. Its a great way of making someone use up hard to obtain resources such as Priests or Mages. The game is played over 8 rounds - by this time I am enjoying the game so much that when round 8 has come I want to continue but totally understand why there is a cut-off. I have played this with 2,3,4 and 5 players and works well with all numbers with possibly 4 being its sweet spot. Even if you are not a D&D fan I would suggest anyone gives this game a go its well worth the time to play a game and like another one of the reviews said its very faithful to the timings on the box. Highly recomended. In this game you place agents to collect resources and gold to complete quests to win the game. It looks at first to be quite a complicated game, but plays really smoothly. The other half wasn't impressed with this game when I bought it but she has completely changed her mind and now loves it. The board, buildings and cards are nicely themed to the Forgotten Realms but the D&D theme is incidental to the game play so non-D&D fans should not be put off. A highly entertaining and engaging game. A great addition to any family's games library. Also the box is brilliantly thought out. A place to store everything and you can play straight out of the box, meaning quick set up and put away. This is a really well put together Worker placement style game with a D&D theme thrown over it. The theme does not really feel worked into the gameplay and could easily be replaced with another. That said the mechanics of the game are extremely solid and well thought out. The game flows well as well as being easy to pick up with minimal effort, it also plays quite quickly which is very good for this style of game. I really enjoyed playing this and the components are well made with an excellent insert that takes all of the pieces after punching, excellent job. I would gladly play this again. Under the banner of Dungeons and Dragons and with the overblown hype above, you might be forgiven for thinking this is an addition to the many D&D RPGs …… When you see that your Agents are medium-sized meeples and your Adventurers are little coloured blocks of wood, you may start to realise that you’re in totally different sort of game altogether – and you’d be right. However, don’t despair for this really is a very good game, albeit one in a familiar line of worker placement ones, like Stone Age or Trajan. Once again you are placing your limited workers, sorry Agents, in a variety of locations to acquire such things as quest cards, buildings, money and technically adventurers by name in the rules, but in reality coloured cubes that are the commodities by which you complete your quests. On the surface there is not a lot that’s new here, but it works. First of all, the quality is excellent from the large mounted board that represents the winding streets and back-alleys mentioned in the promotional blurb to the building tiles that you can acquire, the cards that detail the quests you have to try and fulfil or the Intrigue cards that offer special bonuses or abilities. The player interaction largely comes from deciding where to place your agents. Someone always seems to choose the one you desperately need just before you do! And just for that extra little direct screwage of your opponent, lurking among the intrigue cards are a few Mandatory Quest cards that you can play on your opponent as a nasty little brake on his/her attempts to complete a juicy quest. All this and a playing time which is closer to the suggested hour than many games usually manage to be.